Job prospects appear bleak with the recent release of the provisional estimates of annual national income in 2016-17. The lacklustre performance of the Indian economy observed during the fourth quarter (Q4) of 2016-17 is expected to decelerate the overall growth in real gross domestic product (GDP) in that year to 7.1 percent, down from 8.0 percent that was achieved in 2015-16. It must be noted that GVA is the difference between GDP and net indirect taxes. In order to know more about the concept of GVA, please click here. The growth rate in real GVA at basic price pertaining to the agrarian sector, however, is expected to decline between the last two quarters of 2016-17 (from 6.9 percent in Q3 to 5.2 percent in Q4 of 2016-17). [See chart 1] Apart from demonetisation that was carried out during 8 November - 30 December, 2016, deficit in northeast monsoon rainfall, which was faced by various states from southern part of India during the rabi season of 2016-17, may have been a factor behind this trend. The growth rate in GVA at basic price (at 2011-12 prices) pertaining to the sector 'public administration, defence and other services' is likely to be 11.3 percent in 2016-17 as opposed to 6.9 percent that was achieved by this sector in 2015-16. Experts have argued that it was accomplished on account of increased expenditure by the NDA government in 2016-17, which includes spending on Seventh Pay Commission awards. If the agrarian and government sectors are ignored, then the growth rate in GVA at basic price (at constant prices) for the year 2016-17 would reduce to 6.2 percent from 6.6 percent but for the year 2015-16 it would rise to 9.8 percent from 7.9 percent. Therefore, the drop in growth rate in GVA for the economy (without the agrarian and government sectors) between 2015-16 and 2016-17 would be much sharper compared to the normal situation. Despite a rise in cash deposits with the banks on account of demonetisation, the growth rate in real GVA at basic price pertaining to the 'financial, real estate & professional services' sector is likely to reduce from 10.8 percent to 5.7 percent between 2015-16 and 2016-17 [see table 1]. Similarly, the growth rate in real GVA at basic price pertaining to the 'financial, real estate & professional services' sector is expected to decrease consecutively over the four quarters of 2016-17 (i.e., from 9.4 percent in Q1 to 2.2 percent in Q4 of 2016-17). [See chart 1]. Lower demand for loans and growing portfolio of bad loans with the banks, among other things, could have resulted in slow growth of the banking and finance sector. For example, according to State Bank of India's (SBI) preliminary placement document dated 8 June (accessed from the Bombay Stock Exchange website), its non-performing assets (NPAs) have generally been on the rise. The gross NPAs of the SBI were Rs. 567.25 billion, Rs. 981.73 billion, and Rs. 1,123.43 billion as of 31 March, 2015, 31 March, 2016 and 31 March, 2017, respectively. The same document from the SBI, India’s largest commercial bank, shows that the bank’s gross NPA ratio, which is the ratio of gross NPA to gross advances (loans), was 4.25 percent, 6.5 percent and 6.9 percent as of 31 March, 2015, 31 March, 2016 and 31 March, 2017, respectively. As per the Reserve Bank of India (RBI), an asset, including a leased asset, becomes non-performing when it ceases to generate income for the bank. Economists are worried that the Gross Fixed Capital Formation (GFCF) as a proportion of GDP (at constant prices) has contracted from 31.3 percent in 2014-15 to 30.9 percent in 2015-16, and further to 29.5 percent in 2016-17. It means that the share of investment in capital goods in the GDP is falling. It should be added here that the GFCF as a proportion of GDP (at constant prices) has reduced from 31.0 percent in Q1 to 28.5 percent in Q4 of 2016-17. According to the India Labour Market Update (July, 2016), brought out by the International Labour Organization (ILO), the construction sector has been the main creator of employment. During the recent years, the construction sector has absorbed more workers than any other sector when workers shifted out of agriculture. The highest rise in non-agricultural employment has been noticed in the construction sector, where the share of employment in rural areas increased from 14.4 percent in 1999-2000 to 30.1 percent in 2011-12. However, job creation could have been adversely affected due to a decline in the growth rate in real GVA at basic price pertaining to the construction sector between 2015-16 and 2016-17. [See table 1]. The construction sector is likely to shrink (i.e., growth rate in real GVA at basic price pertaining to construction is expected to be -3.7 percent) during the fourth quarter of 2016-17. [See chart 1]. Experts have argued that the cash-dependent construction sector received a massive jolt due to demonetisation. It had also impacted sectors like 'financial, real estate & professional services', 'trade, hotels, transport, communication and services related to broadcasting' and ‘manufacturing’, they have said. The 28th Quarterly Report on Changes in Employment in Selected Sectors (October, 2015 to December, 2015) has found that the overall employment (in terms of the number of persons employed) in the eight selected sectors of the economy had decreased by 20,000 between September and December, 2015. The report is also known as the 28th Quick Employment Survey (QES). On comparing the 28th and 24th QES’s, it could be said that between December, 2014 and December, 2015, the employment generation (in terms of the number of persons employed) in the eight selected sectors of the economy was 1,35,000. However, between December, 2013 and December, 2014, the employment generation in those eight sectors was much higher, i.e., 4,21,000. This shows that job creation is taking place at a much slower pace. The eight selected sectors that were considered for the QES’s are: textiles (including apparels), leather, metals, automobiles, gems & jewellery, transport, IT/ BPO and handloom/ power-loom. The growth rate in real GVA at basic price for the entire economy during Q4 of 2016-17 is likely to be the lowest as compared to the previous 7 quarters (i.e., the 3 quarters of 2016-17 & the 4 quarters of 2015-16). The growth rates in GVA at basic price (at 2011-12 prices) during Q1, Q2, Q3 and Q4 of 2016-17 (over Q1, Q2, Q3 and Q4 of 2015-16, respectively) are estimated to be 7.6 percent, 6.8 percent, 6.7 percent and 5.6 percent, respectively. The growth rates in real GDP at market price during Q1, Q2, Q3 and Q4 of 2016-17 (over Q1, Q2, Q3 and Q4 of 2015-16, respectively) are likely to be 7.9 percent, 7.5 percent, 7.0 percent and 6.1 percent, respectively. 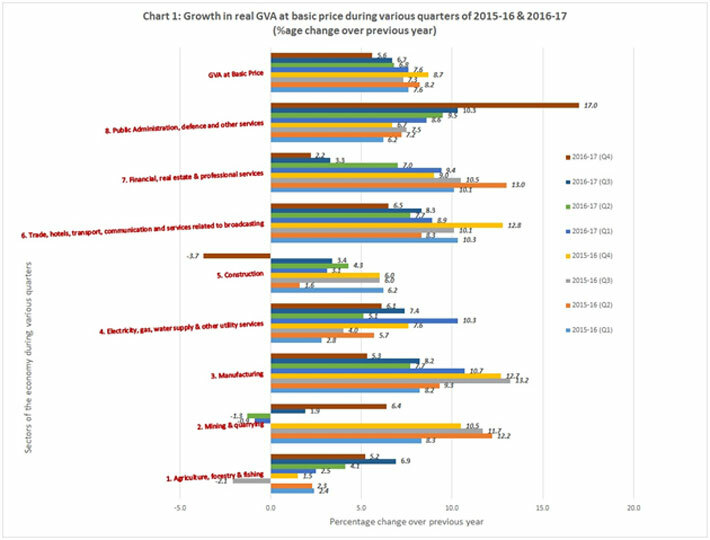 The growth rate in GVA at basic price (at 2011-12 prices) has dipped between third and fourth quarters of 2016-17 for the sectors – 'agriculture, forestry & fishing', 'manufacturing', 'electricity, gas, water supply & other utility services', 'construction', 'trade, hotels, transport & communication and services related to broadcasting', and 'financial, real estate & professional services'. However, growth rate in real GVA at basic price pertaining to the ‘mining & quarrying’ sector has upped between Q3 and Q4. [See chart 1]. 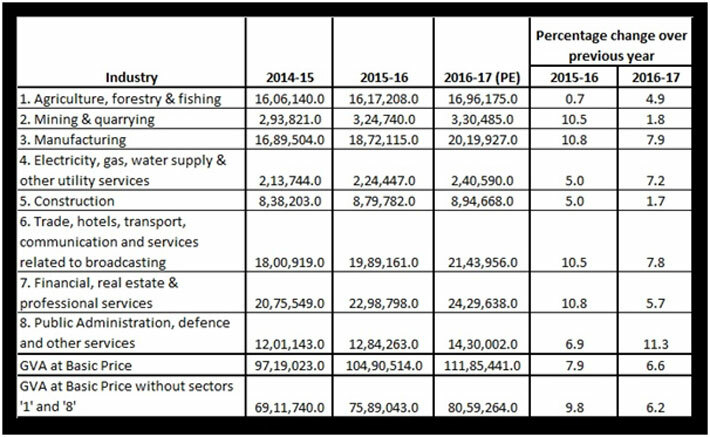 One may also note that the growth rate in real GVA at basic price has fallen between the Q4 of 2015-16 and Q4 of 2016-17 for the sectors – 'mining & quarrying', 'manufacturing', 'electricity, gas, water supply & other utility services', 'construction', 'trade, hotels, transport & communication and services related to broadcasting', and 'financial, real estate & professional services'. [See chart 1]. It has been argued by experts that the informal sector of the economy faced the real brunt of demonetisation. The recently released estimates of national income have not taken fully into consideration the negative impact felt by the unorganized sector. Therefore, it would be wise for us to wait for the final figures on national income from the government, which is expected to be released in January, 2018 (as per various media reports). 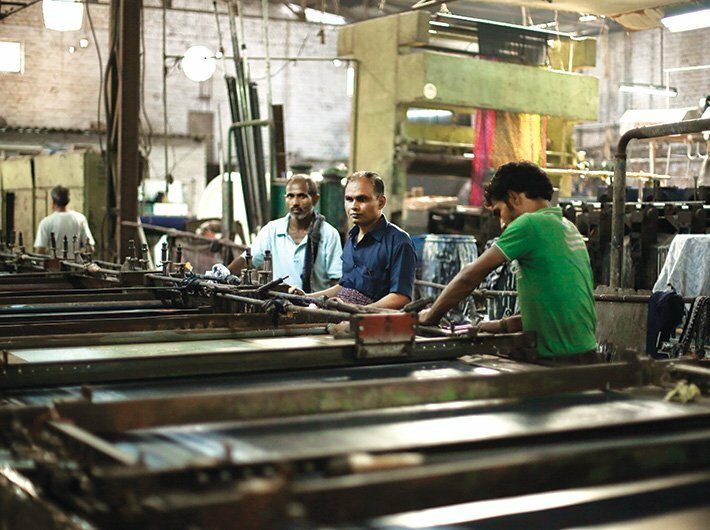 By then, the shock felt by the informal sector would be taken into account while presenting the overall performance of the economy in 2016-17. SBI in its preliminary placement document dated 8 June has cautioned its investors that demonetization has and may continue to result in a slowing down of the Indian economy, which may adversely affect the bank’s business. However, it remains to be seen whether the adoption of a Goods and Service Taxes (GST) system will help in reviving private investment and moving forward the economy in 2017-18.